First Bank in New Zealand. History of the Petone Fire Brigade. First Petone Race Meeting, 1842. A Business Built on Personality. The "Ideal" Dairy, Manchester Street, Petone. Petone Dyes for the Dominion. Containers of the Dominion's Produce. A Business Built by Service. New Zealand Motor Bodies Limited. 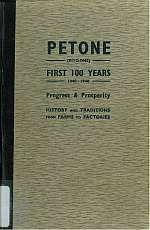 History of Petone Gas Works. R. W. Short & Co. The fine modern factory of W. D. & H. O. Wills (New Zealand) Limited, Petone. The Original FlagFlown After a Century. Sitting Members Of Petone Borough Council.